He making the final turn and heading for the finish line at the front of the pack! The brunette male runner personalized Christmas ornament includes a display ribbon and his custom details hand painted in a handsome font. These sports ornaments personalized as mementos of effort and success are available in several other appearances, and coaches often have one made for each member to build team unity. 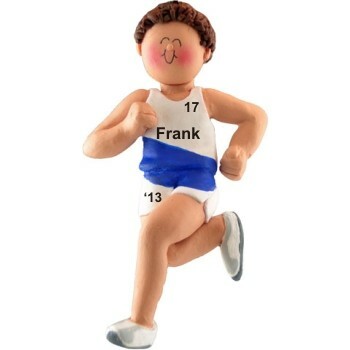 Sprinters, cross-country competitors and long-distance specialists all love the cross country / jogging male brown hair personalized Christmas ornament in our exclusive velvet drawstring pouch. Christmas Gift Jan 4, 2016 Carey M.
event that happened during the year Dec 1, 2015 Sherrianne S.